I remember my first encounter with these mushroom filled dumplings vividly. The year was 2006 and I had innocently borrowed a book on Eastern European food from the library. I had no idea what to expect from the book, a fact which contributed greatly to my curiosity of course. The more I turned the pages, the more pleasantly I was surprised by the variety of dishes and I admit, I fell a little bit in love. Of course, at that stage I was still firmly entrenched in my fiery love affair with all things Asian. The stodgy Eastern European food was a far cry from the light and flavourful stirfries that graced our table most nights. But there was something about that book, that kept me coming back for more. There was himmel und erde (lit: heaven & earth), a lovely German dish of apples (the heaven part) and potatoes (the earth bit), served with crispy fried onion and blutwurst. Of course I was too chicken to serve it with blutwurst, but I was all over the rest of that combo. Vibrantly coloured borscht leaped out at me, begging me to shine a spotlight on the humble beetroot and TheHusband was overjoyed when I announced my desire to make Black Forest cake. And then there was uszka. Without a doubt, my favourite of all the recipes I tried in those few weeks (yeah I returned that sucker late to the library. The fine was worth it). 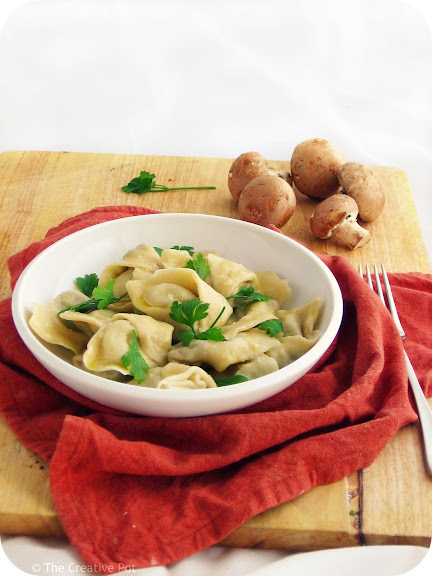 A delicate mix of mushrooms and onions, flavoured with garlic and herbs and encased in whimsical dough parcels. Drenched in melted butter. What's not to love? Well there's the fact that they are - mmm how to put this delicately? - super labour intensive! I'm warning you, this is not the recipe to haul out when you're short of time or impatient. But if you want to shift down a gear or two or need some time to mull over important issues, these are your friends. Folding the individual uszkas is strangely calming, so pull up a comfortable chair and a glass of wine and settle in. Of course you could rope in some friends or family to help out and set up a sort of production line. Roll, cut, fill and fold. You'll be done in a fraction of the time. But personally I enjoyed sitting down by myself and folding folding folding. Sometimes it's the simple things in life, isn't it? 1. Make the dough by combing flour, salt egg and 6 tablespoons of the water. Mix until the dough comes together, adding more water if necessary. Knead briefly to form a smooth dough, then cover and allow to rest for 20 minutes. 2. Meanwhile, heat butter in a medium sized frying pan. Add garlic, mushrooms and onion and cook until softened. Stir breadcrumbs and parsley through, then season to taste with salt and pepper. Remove from stove and allow to cool. 3. Roll dough out very thinly, then cut into 2.5 x 2.5 inch squares. Place a teaspoonful of the filling in the centre of each square, then moisten 2 of the edges and fold the other edge over towards that edge to form a triangle. Press to seal the dough, then moisten the two bottom corners and fold towards the middle, overlapping each other. Refer to photo to see what the finished uszka should look like. Repeat with the rest of the dough. 4. Cook the uszka in batches in a large pot of boiling salted water. They will only take a few minutes to cook and are ready when they rise to the top of the water. Remove with a slotted spoon and set aside, keeping warm until all the dumplings are cooked. These are traditionally served floating in barszcz (Poland's version of borscht), but I like them drizzled with hot melted butter and garnished with chopped parsley. Note that the dough needs to be rolled out very thinly, otherwise you will have trouble forming neat dumplings. 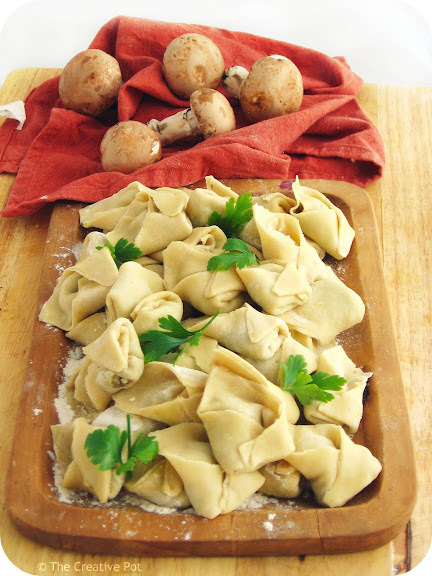 If you struggle to form the dumplings, you can leave them as triangles, omitting the last fold. I LOVE dumplings! I think they might be the reason I picked up about 10kg while working in Taiwan for a year, cause I really stuffed my face. I am no cook but I might just try my hand at these. Looks yummy and I really like your photos! Love & Stuff - These really aren't difficult to make, they just take some time. Hope you enjoy them! Claudz - Thank you! Always difficult to photograph lumps of dough. Oh my gosh, love dumplings......if you know how many mushrooms I have in my home, you will come right over so we can make some!! Well done!! They seems super delicious!! I will try the version with and without the barszcz. Anula - Thanks for a super challenge this month. And sorry I veered off a little bit, I just couldn't resist these! Nina - I still have a whole punnet left myself, I overestimated the amount I would need for these. :-) Mushroom cook-off? Mika - Let me know how they taste when served with the soup, am very curious! These are simply elegant! And you're right, don't do them when you're rushed or stressed. Exactly the mistake I made this go around and it showed. You, my friend, did an amazing job on the challenge. Nice work! Great job and your dumplings look absolutely gorgeous. The wrapping is so neat and reminds me of little wontons. Oh these are pretty. These are really really pretty. Well now I know what I'll be making the night before my next test...stress relief and procrastination in one fell swoop. Wow, this looks great! I love the way your dumplings turned out. Great job! And the mushroom filling sounds incredibly delicious. This is great! So glad to have this recipe. My husband is from a Polish family and I'm always looking for more recipes that speak to our cultural heritage. I definitely have to try these! These look delicious! I love the mushroom filling! 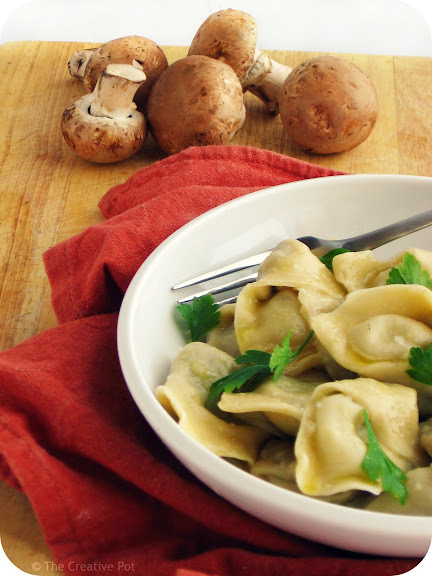 for me, mushrooms + garlic + parsley is the best combo! Love the photos - those look delicious! Julie - Thanks, you're right, it really helps to take things slow sometimes. Jo - Yeah, they do look like wontons, don't they? Real wontons still on my to-do list though. MaryMoh - They really are international, aren't they? Almost all the world cuisines have some form of dumpling. Chef_d - Appreciate you stopping by! Tariquata - I have to admit, the filling is really good. I even ate some just like that. Lori - Awesome! Glad to have assisted you in your quest to honour your husband's heritage. Cuppy - Butter for the win. :-) Have to try them with borscht, sounds so unusual. Juanita - Thanks, that means a lot as I really struggled with these photos. oh my goodness, I MUST have it! Oh I love uszka with a good portion of barszcz. yum yum yum!